I haven’t made scones in like for-ever. I’m not sure why either. 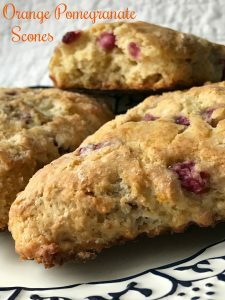 In fact, when I decided to make Orange Pomegranate Scones, my first thought was,”I can’t believe I haven’t made scones in such a long time.” Scones can be made with just about any ingredient you can think of or scones can be made without any added ingredients. With a refrigerator full of oranges and a freezer baggie full of pomegranate seeds, this recipe was a no brainer. Scone [SKOHN; Br. 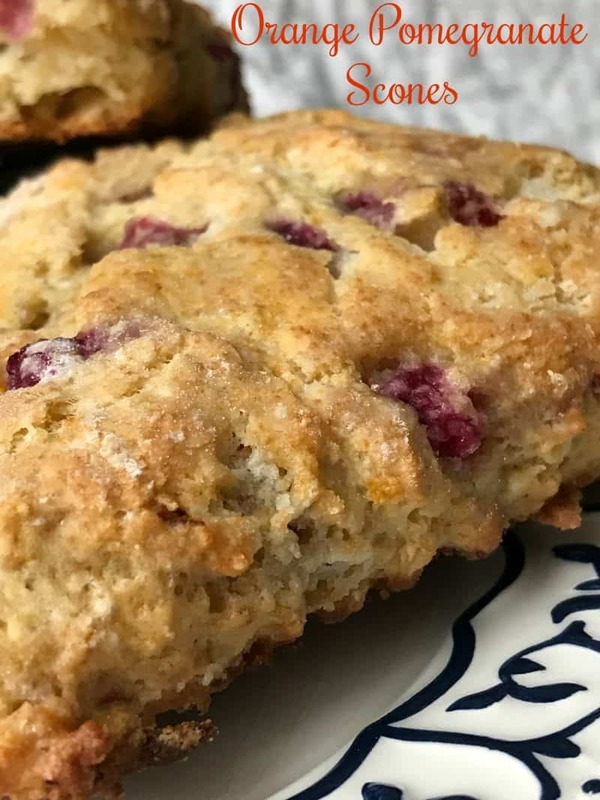 SKON] This Scottish Quick Bread is said to have taken its name from the Stone of Destiny (or Scone), the place where Scottish kings were once crowned. 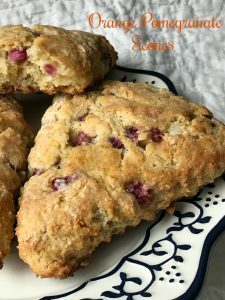 The original triangular-shaped scone was made with oats and griddle-baked. Today’s versions are more often flour-based and baked in the oven. They come in various shaped including triangles, rounds, squares and diamonds. 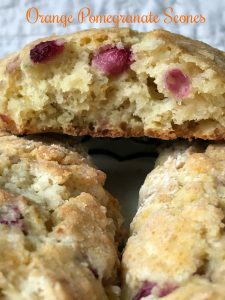 Scones can be savory or sweet and are usually eaten for breakfast or tea. Pomegranate [POM-uh-gran-uht] Nature’s most labor-intensive fruit is about the size of a large orange and has a thin, leathery skin that can range in color from red to pink-blushed yellow. Inside are hundreds of seeds packed in compartments that are separated by bitter, cream-colored membranes, Each tiny, edible seed is surrounded by a translucent, brilliant-red pulp that has a sparkling sweet-tart flavor. Pomegranates are grown throughout Asia, the Mediterranean, Africa, India, and in California. Choose those that are heavy for their size and have a bright, fresh color and blemish-free skin.